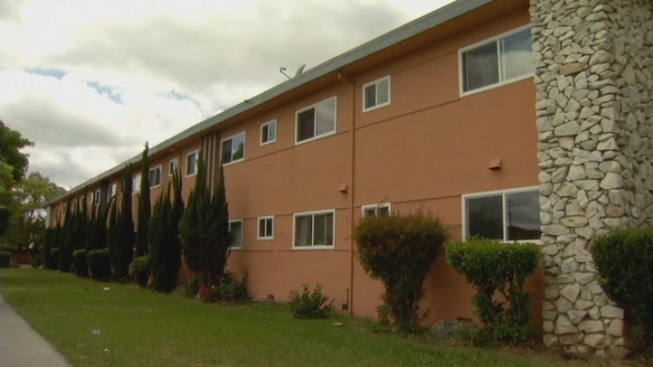 Tenants at a San Jose apartment complex are considering legal actions after saying they have endured years of "slumlord conditions." Residents also point out it has been nearly a year since two children almost died in a fire at the building. The tenants of the complex at 1991 Story Road say, at that time, the city vowed to resolve the situation. But on Friday the tenants claimed that has not happened. Gloria Zamudia, a tenant representative, said the city finally paid attention to their problems after two children had to leap to safety during a fire in June 2015. She said inspectors then found 109 code violations. But, in Zamudia's opinion, San Jose's Code Enforcement has not done enough since and has given the owner too much time for compliance without any fines since the fire. The group South Bay Tenants Union echoed that complaint. "And knowing that the focus is on there, between tenants, advocates, the media, city council, that they would have taken care of it," said Shaunn Cartwright with the South Bay Tenants Union. "But that hasn't been the case." The city's code compliance department acknowledges the long list of code violations. In fact, there were violations in almost every unit. But officials say soon after the fire they had the owner replace all smoke detectors, 22 stoves, bathtubs, sinks and a major gas line. Construction is also underway on new stairways. "The property owner has been making progress on correcting any and all violations that we found," Code Compliance spokeswoman Cheryl Wessling said. "Work is continuing at this time and we are satisfied with the progress being made."